Imagine a rainy day, and a car drifting over into your lane. You swerve and start to skid. You lose control of your car. It’s certainly possible, and especially for a new driver. As I head ever closer to 16, I am anxiously counting off the days until I get my learner’s permit. I won’t tell you the exact date, but those who know me well enough know that date. When I was little, my mom would make a paper chain before an exciting event. I would rip a link off everyday, counting down until the big moment. Anybody have those? BMW Teen Driving School is what it sounds like. This course teaches teens how to handle the Ultimate Driving Machine in icky conditions. Instead of using thousands of gallons of water for the skidpad, BMW uses a special chemical favored by many militaries around the world. This chemical is safe, and it replicates ice, snow, or rain-covered asphalt. There is a family program that teaches parents how to be good driving role models for their teen. Parents can take this course, test-drive as many Bimmers as they want on the same course their youngsters are driving, or go go-karting. This course takes place at the BMW Testing and Performance Center in Spartanburg, South Carolina. This is also the factory for the BMW X1, X3, and X5. If you are interested in going to this course with me, you can visit bmwusa.com/performancecenter#teenschool for even more information. The cost is $550 for one day, and $950 for two days. Sim Raceway Highway Survival Driving School: Sim Raceway sounds like a game for the xBox. It’s most certainly not. This school teaches drivers how to be good drivers on highways. The course teaches drivers how to drive cars on the highway in appalling conditions. They have to pass other drivers on a long skidpad. Where does this take place? Beautiful Sonoma Raceway! Close to where I live! The reviews are 100% positive, and everybody says that the instructors take pride in teaching teens how to drive well on highways. I can’t wait to see you guys at one of these driving programs! Not that I have any free time. What I mean, is that ALL my spare time is spent in earnest study. If any educators happen to follow my blog, I would like them to know I am the (get ready for this) epitome of studious. All disclaimers aside, last weekend, I was looking at people drifting and spinning out their cars on the Nürburgring (highly recommended if you want a good laugh!) on YouTube. It was a four day weekend, after all. I found this video of what may be the quickest Formula 1 pitstop ever! I don’t know where the video was taken, but it is hilarious! All I know about this location, is that it is near the woods. The car pulls in, the pit crew starts filling up the car and taking the wheels off. They are just starting to put the wheels on when you hear a snarl right next to the camera. The camera whips around, and there is a bear. Right there! The camera man utters words not appropriate for small children, and then everybody runs. For the woods. Enjoy! Do Diesels Run Cooler Than Gasoline-Power Cars and/or Hybrid-Electric Vehicles? Okay, for those of you who helped me with my science fair project, daydreaming may occur. For those who did not help me, listen up, and look. The popular urban myth is that a diesel engine will run cooler than a gasoline engine and/or a hybrid-electric engine. I had always been interested in this myth, and wanted to find it out for myself. I decided to try and figure out if it was true. It wasn’t. How did I figure it out? Google is not the answer. A science fair project was the answer. For me. Read below to find out what my findings tell us! The hypothesis states: If a diesel engine idles at 9 degrees Celsius, then it runs cooler than hybrid-electric engines and/or gasoline-power engines. Some research has been done to see if this myth is true. From what I found, in 1998, the EPA, CalTech, and UC San Diego all did similar (if not the same) experiments. The EPA wanted to know if heat on an engine decreased fuel economy, and CalTech and UC San Diego wanted to know if electric motors ran cooler than diesel engines. My procedure was a bit more complicated: To start the experiment, the car had to be measured “cold” – before it had been turned on. The thermocouples were then attached to the: Radiator, engine block, and exhaust pipe. All measurements were taken in degrees Celsius. Once the measurements had been recorded, the outside temperature was taken (as a good base to compare against). The car was then started and allowed to run for five minutes without the climate system running. When the clock hit five minutes, the car was turned off, and the measurements were taken again. The different temperatures were compared against one another. The results are what I expected. I must be a car guru, since I was able to predict this (or at least I read my research!!). Since I can’t draw a table on WordPress, I’ll have to go by car, okay? 2013 Toyota Prius Plug-in: Engine block cold: 17 degrees Celsius, Engine block heat after five minutes: 21.8 degrees Celsius, Radiator heat cold: 14 degrees Celsius, Radiator heat after five minutes: 13.9 degrees Celsius, Tailpipe heat cold: 15 degrees Celsius, Tailpipe heat after five minutes: 14.1 degrees Celsius, Temperature outside: 16 degrees Celsius. 2003 Chrysler Town & Country*: Engine block heat cold: 30 degrees Celsius, engine block heat after five minutes: 58 degrees Celsius, Radiator heat cold: 13 degrees Celsius, Radiator heat after five minutes: 14 degrees Celsius, Tailpipe heat cold: 18 degrees Celsius, Tailpipe heat after five minutes: 17 degrees Celsius, Temperature outside: 13 degrees Celsius. 2003 GMC Sierra 2500HD: Engine block heat cold: 9.2 degrees Celsius, Engine block heat after five minutes: 9.2 degrees Celsius, Radiator heat cold: 8.5 degrees Celsius, Radiator heat after five minutes: 8.7 degrees Celsius, Tailpipe heat cold: 9.0 degrees Celsius, Tailpipe heat after five minutes: 16.2 degrees Celsius, Temperature outside: 15 degrees Celsius. By crunching the data, one can easily find out that the GMC Sierra 2500HD 4X4 6.6L Duramax Diesel easily runs cooler than any of the other vehicles used in this experiment. An optimal idling temperature for a diesel engine is 9.2 degrees Celsius. Both above and below this temperature, the engine will run smoothly. However, at heat greater than 75 degrees Celsius, the idle quality will start to degrade. By the heat redline of 104 degrees Celsius, the idle quality of the vehicle will have degraded to such a point that it will crack the engine block, or cause some other form of damage to the engine. For those of you interested in doing a similar experiment, here are some similar experiments that you can do: Only hybrid-electric vehicles, only gasoline-power engines, and only diesel engines. These results can then be compared to the temperature gauge in the vehicle. A final experiment could be measuring the temperature of the engine from the temperature gauge alone. *The asterisks by the 2003 Chrysler Town & Country LXi AWD 3.8L V6 are important – the experiment was conducted twice. The first measurements may have been a bit inaccurate due to the fact that the Town & Country had just been driven for over an hour. The second experiment was what I expected, as the car had sat overnight. I didn’t make it to the County finals, but I loved my topic. Many thanks to Mark Miller for providing all the instrumentation, and to Unc Howie for being such a good sport and not even asking for clarification when I said “I want to do a science experiment on your brand new Prius.” You guys are the bomb! Just over a month ago, Motor Trend‘s Senior Features Editor, Jonny Lieberman, invited me and my dad out to Mazda Raceway Laguna Seca. For what? To watch a 2013 Chevrolet Corvette ZR1 face off against the 2013 SRT Viper GTS. To be there by about 10:00 AM, we had to wake up at 4:00 AM. It was worth it, though. When we arrived, Motor Trend‘s hired racer, Randy Pobst, was warming up the Vette. What a nice way to start off the morning, don’t you think? The ZR1 was a bit on the cold side too, so it wasn’t super loud. Yet. Randy was taking it slow – “warming up” in Randy’ eyes is a steady 130 mph, as the track was still cold. Words don’t do justice to how nice both these cars look and sound! We sat around and talked for most of the morning with the lovely sound of the ZR1 blasting around the track at ridiculously high speeds. Both cars were black cherry with black racing stripes on a black interior. Well, the Corvette had a grey and black interior that certainly wouldn’t be very comfortable for a six-hour blast back down to Los Angeles. While these cars are fast, nice cars to drive, they really aren’t meant for drives up and down the state. Jonny, and Scott (Motor Trend‘s Road Test Editor) had to drive both cars up to Laguna Seca, and down to Los Angeles. Jonny had driven the ZR1 to Laguna Seca, and he said that it got very hot in the interior. Why? Think 6.2 liters of V8, supercharged to the tune of 638 horsepower! The engine is so big that it made anything below his knees start to get hot and sweaty. Yuck. Scott was lucky enough to drive the Viper up. He said that it was very loud (at one point, he was listening to the radio, and he had to turn the volume all the way up to just barely hear it. Plus, it’s bluetooth system wouldn’t sync to his brand-new iPhone! ), AND it was uncomfortable. Anything below his knees got very hot, and his left leg got really hot from being so close to the exhaust pipe! He couldn’t wait to take the Corvette back down! The photo crew was taking about a billion pictures of the Viper and the Polestar Volvo S60 (see future blog post). The technical crew was in a corner of the garage (their choice, I’m pretty sure…) analyzing data of the ZR1 as it was lapping the track. Idling in the shade of an outbuilding was an ambulance (standard procedure for all Motor Trend articles, a little bird told me). Throughout the day, various people from the track came to gawk at the cars. As Mazda Raceway Laguna Seca borders a regional park with a bike path, many bicyclists were riding up to the top of the hill to get a bird’s-eye view of the ZR1 flying around the track. Awesome! At about noon, pizza was delivered and devoured by the starving camera crew (photographers CAN move fast!). Jonny’s boss, Ron Kiino (the Executive Editor) called the pizza parlor for more pizza. Unfortunately, all the Motor Trend staff were busy, so my dad HAD TO (yeah, right) go get the pizza. Ron graciously let him take his 2012 Volkswagen Jetta GLi to go fetch the pizza. My dad drove out of the 30-acre parking lot like, well, a guy in a Volkswagen Jetta GLi. To get to Laguna Seca, one has to go driving on a pretty curvy road. My dad had some fun with the GLi (brakes WERE used, Ron!) on the road, but thoughtfully declined to do so when returning with quite a few boxes of pizza. The pizza was good, but it was even better to eat it while listening to Randy drive the Viper around Laguna Seca as fast as he dared. Randy may be an amazing driver, but he was scared to get a 1:35 lap around Laguna Seca in the Viper. Why? At one point, he was going along one of the two straights at Laguna Seca, which leads to a sharp turn and dip at around 150 mph. He didn’t have time to downshift or brake, so he went flying over the dip and hurtled into the turn. He wasn’t sure what was going to happen. What happened was he nearly spun, but was able to wrangle the car into a drift. Impressive. What was more impressive is that he grabbed it by the scruff of the neck, and gave it a lesson on how to drive around a racetrack. Really well done. Randy also had to be reminded multiple time not to touch the doorsill of the Viper (he likes getting in and out of a car that way), as the tailpipe exits right by the door. It makes the interior REALLY hot, and it gets very noisy inside the cabin. Next up on the agenda was basking in the sun and talking to various people like the managing director of Polestar, Hans Bääth, and the fleet technical manager of the Prietive Group, Ryan Minor. Hans, Ryan, my dad and I had a wonderful time talking about the Polestar S60. What did we talk about? The history of Polestar and Volvos, and just about everything related to Polestar and the S60. Awesome. Then, the Polestar had a chance to go out onto the track. While 508 horsepower is weak compared to the 640 horsepower put out by the mighty Viper, it’s still more than enough to move the Polestar 60 around Laguna Seca for a 1:41.26 lap. If you see a regular S60 driving along, you know that it won’t go nearly that fast around Laguna Seca. But, if you see a blue S60 with big exhaust pipes and big wheels with fat tires, you can rest assured that whatever you’re driving is about to be smoked. Anyways, Randy came off of the same hill that he almost spun in the Viper, landed at 120 mph, and lost all power to the rear wheels (the car is AWD). He then, er, limped in at 100. He wasn’t happy. Nobody was. It was amazing to listen to Randy tell the Polestar techs how the front left wheel was spinning 10% faster than the front right wheel. Somehow, he was able to calculate this while simultaneously knowing that the AWD system had failed, all while going 120 mph. If I could do all of those calculations, I would never get a speeding ticket or get into an accident…The Polestar techs jacked up the car, one went under and checked out the AWD system while the other was checking out the engine. They don’t know what happened, but they took it for a few laps, and it was fine. Randy jumped back in and banged out a 1:40 flat. Two times in a row. It had a nice sound. You know how turbos make the engine sound like a boat engine? This engine sounded like it was ready to blast around the Nurburgring – at full speed. As soon as Randy got out, he said it was a challenge to drive around Laguna Seca near the car’s limits. It kept understeering when he needed it to oversteer, and it leaned a lot in the corners. He said that it’s the type of car that you can comfortably drive at 8/10 of the car’s limit, but take it up to 9/10, and you’ll wish you didn’t. For those of you who don’t know what 8/10’s of the limit of a car is, it’s 8/10’s of the technical limits of the car. There really aren’t many other ways to describe it. The feeling is nice, especially when the car is comfortable like this one is. Otherwise, it can be boring, or scary. Hans, if you just read that, when can I become a test driver for Polestar? The next beast of a car up on the agenda was the Volkswagen Golf R. With a powerful 256 horsepower, 2.0 liter turbocharged engine wedged under the small hood, it made a lot of nice sounds. It was slower than the others, but that could be a variety of reasons. Power is definitely one of them, handling is another, and speed is yet another. But, it was pretty darn fast for something it’s size. If you think about it, many of it’s competitors couldn’t go that fast at Laguna Seca without drifting and understeering all over the place (I’m talking to you, Subaru STI, Ford Focus ST). I just have one thing to say to the whole Motor Trend crew: THANK YOU SOOOOOOOOOOOOOOOOOOOOOOOOOOOOOOOOOOOOOOOOOOOOOOOOO MUCH! It was an amazing experience! And to all my faithful readers, feel free to tell me which car you think should win, and why. If you have any experiences with a Corvette ZR1, Polestar Volvo S60, Volkswagen Golf R, or a SRT Viper GTS Launch Edition, you can tell us in the comment section. It’s okay, I want to know your experiences! Thanks again, Motor Trend! It was an awe-inspiring experience! One of my faithful subscribers happens to be family, and snapped a picture of this wonderful 2004? Porsche Carrera GT near his house last week. 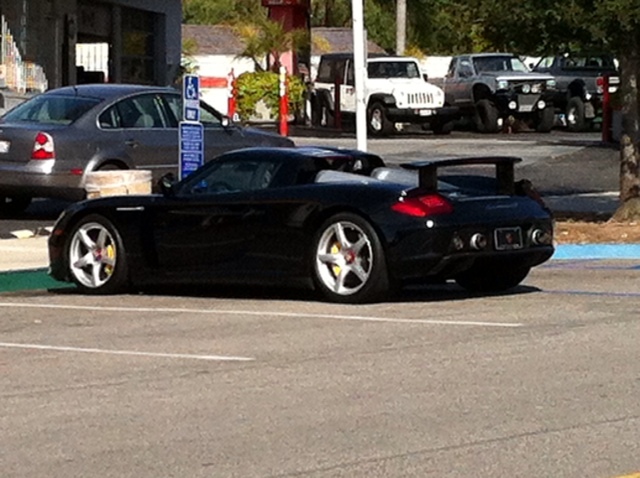 I’ll give you some background information on the famous Porsche Carrera GT, okay? In 1997, Porsche decided to build a car that would dominate endurance races. It had a powerful 5.7 liter V10 that pumped out a massive 750 horsepower. It weighed a mere 2700 pounds. Unfortunately, the FIA passed new rules stating that cars racing the 24 hours of the Nurburgring had to be racing versions of a production car. Porsche had already invested almost 1 billion dollars on the car, and didn’t want to lose any money on it. What did they do? They made it road-legal. It was the fastest car of it’s day, and is still one of the fastest production cars to lap the Nurburgring, with a time of 7:57.39. Porsche saved a lot of weight by making the engine block out of carbon fiber. That took almost 300 pounds off the weight of the car. When NHTSA wanted to rate the car, Porsche had not started producing their carbon-fiber chassis’. Porsche sent a car with a racing chassis to NHTSA, where the safety tests were performed. The results were astonishing – the car was so safe that it scored 92% on all of the tests. Porsche then sent a carbon-fiber chassis a couple of years later, and found that it was still safe, just 10% less. The Porsche Carrera GT could hit 205 mph, and go at that speed for over an hour before it needed new tires and a refueling. Oh, and it cost $440,000 new. Now, you can expect to find a “cheap” one for $400,000. The more expensive ones can go for almost $800,000. It’s a price well-deserved, though. The driving experience is second to none, and it is one of the few cars that can hit 200 miles an hour with a stock manual transmission. Check back Friday when I describe one of the best days of my auto journalism career? Life? For those of you who remember the true dark ages of GM – 2008-2010, many well-loved brands such as Saturn and Pontiac got axed. Yes, some Pontiacs were bad, but not all of them were. The Pontiac G8 was one of the best Pontiacs to come out of the factory since the original GTO. Or so said Bob Lutz. I believe him. When Pontiac was axed in 2010, work was underway by Bob Lutz to bring the popular Holden Commodore (Australian-market car) into the U.S. as a Chevy. We won’t know much else about the 2014 Chevy until it’s launch just before the Daytona 500. Don’t be surprised to hear a 6.2-liter LS1 engine – not the 5.7 – the 6.2. It will likely be a pumped-up version of the Corvette Stingray’s. We know that transmission choices will consist of a six-speed automatic and a six-speed manual. GM’s North American president, Mark Reuss said of the 2014 SS (street car) at the race version’s debut last week, “It’ll be a halo car for Chevrolet because we really don’t have a high-performance four-door sedan. It fills that niche.” It will be a driver’s car for more than just the driver. Right now, the Corvette and the Camaro ZL1 are the drivers cars, but they can’t hold five people. Comfortably. Don’t expect to see too many on the road – an initial production run of 5000-10000 units is proposed. Of course, there aren’t any pictures of the street SS, but there are some pictures of the NASCAR SS for you to drool over.